One of the most iconic STAR WARS vehicles of all time, in a totally new scale that has to be seen to be believed! The massive STAR WARS HERO SERIES X-WING FIGHTER is ready for even bigger battles, and is sure to become a collection centerpiece for kids and collectors alike! Standing at 12-inches tall, these large-sized action figures feature classic STAR WARS characters as well as all new heroes and villains from the new animated series STAR WARS REBELS like EZRA and AGENT KALLUS. Each 12-inch figure features a great size and play value at a fantastic price. Each sold separately. Team up characters or pit them against each other with these awesome 2-figure packs, featuring heroes and villains from the STAR WARS saga and from the new animated series, STAR WARS REBELS! Each pair of figures highlights an epic rivalry or a classic partnership. Each pack is sold separately and includes two figures with five points of articulation and accessories. The signature weapon of the INQUISITOR, the fearsome new villain from the new animated series STAR WARS REBELS, comes to life in toy form! The INQUISITOR LIGHTSABER lets kids choose which way they duel their opponents with three ways to play! Start the battle with a single blade, then attach the second blade to the special hilt for three feet of double-bladed power. And, for the first time ever, launch the FORCE DISC for a long distance strike! Kids can customize their attacks with STAR WARS COMMAND Invasion Packs. Each pack features ten permanently posed and collectibly-sized figures—eight soldiers and two specially detailed Generals—plus four vehicles on stands and two special Strikers that kids can rev up and launch into battle! Each pack sold separately. Now, kids can finally take command of the greatest battles in STAR WARS history! STAR WARS COMMAND lets kids pit huge armies of micro-figures and vehicles against each other for the fate of the galaxy! Using the Controller, you can control the flagship of the evil GALACTIC EMPIRE with the power of the FORCE!! Send the STAR DESTROYER backwards or forwards, then unleash up to 4 Energy Blast balls to devastate your opponent’s army! Also comes with eight permanently posed and collectibly-sized figures—six soldiers and two specially-detailed Generals. In 2013, Hasbro took collectible STAR WARS action figures to the next level with the introduction of the 6-inch BLACK SERIES action figure line! This exceptional collection of figures features incredibly accurate design and a high level of articulation of the greatest characters from the STAR WARS universe. New figures in 2014 include STORMTROOPER, OBI-WAN KENOBI, LUKE SKYWALKER and ANAKIN SKYWALKER! Each sold separately. The STAR WARS BLACK SERIES 6-inch Deluxe assortment takes STAR WARS action figures to the next level with the introduction of iconic in-scale vehicles and alien creatures, all featuring the incredibly accurate design and high level of articulation fans have come to expect from the STAR WARS BLACK SERIES. Each sold separately. Read on for the images and the Star Wars Holiday Buyers Guide. 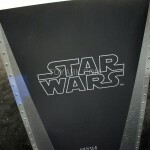 Here are the photos of the Star Wars Black Series display from San Diego Comic-Con 2014. These include looks at new 3.75″ figures and mostly previously released/seen figures. Expect new reveals as the show continues! The first Black Series 3.75 Inch figures for 2014 are confirmed with pretty high res pics and info. Check them all out inside. The folks over at Jedi News have dug up, what is potentially, a massive list of upcoming Star Wars Figures. Included are many unannounced Star Wars Black Series 3.75″ and 6″ Figures. Also included are some Mission Series, Saga Legends, 12″ Figures, Role Play items and more. You can check out their listings Here and Here. A slew of Star Wars items from Gentle Giant at San Diego Comic-Con 2012. Added pics of the Gentle Giant Star Wars 12″ Kenner Reissues that were on display. Hasbro and Disney are teaming up for an exclusive Star Wars figure set based on the Star Tours ride. The set will include the Star Tours Officer, an original character for the Star Tours ride. 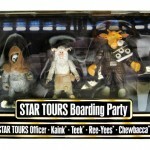 The set will also include Kaink, Teek, Ree-Yees and Chewbacca. The set will be released this May during Disney’s Star Wars Weekends in Florida’s Walt Disney World. It will only be available at Walt Disney World and Disneyland resorts. It will be a one time production run of 15,000.